Falkenbergs IP the home ground of football team Falkenbergs FF who are competing in Sweden’s highest league, Allsvenskan, for the first time in the 2014 season after winning the Suprettan division. 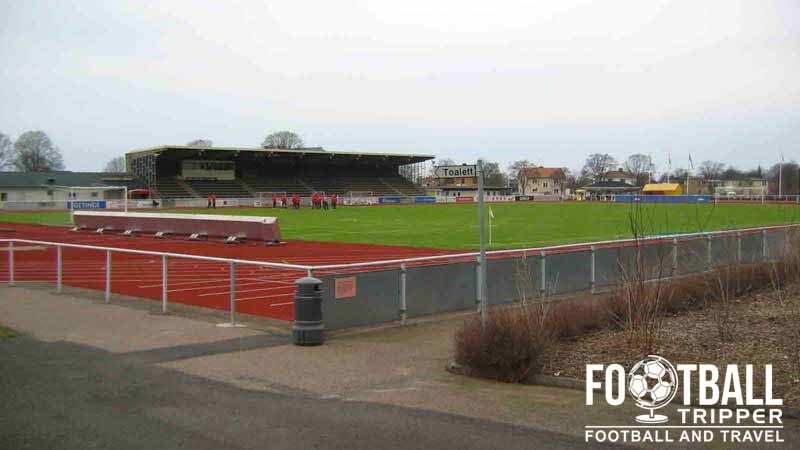 Located rather predictably in the city of Falkenburg, the stadium has a capacity of 4,000. A more detailed history section of Falkeburg football stadium to be added in due course. Falkenbergs IP is comprised of four stands: North, East, South and West. 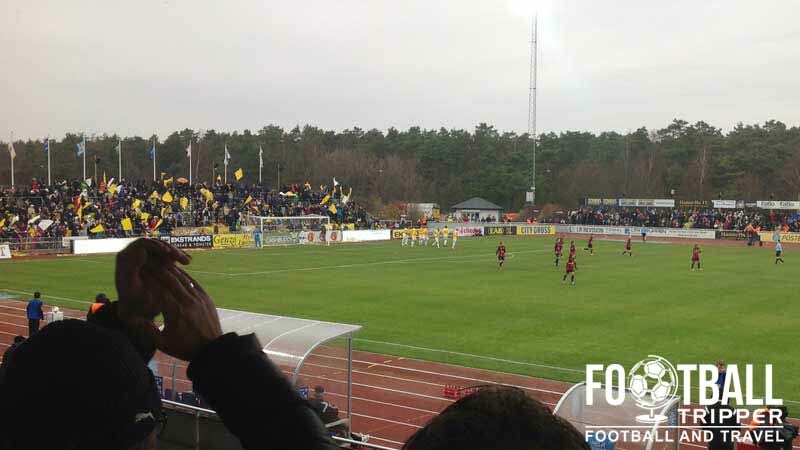 Away fans (Bortasupportrar) are housed within the end of the secondary stand within sections K and L. Tickets for the visiting supporters cost 150 SEK and entrance to the ground is via gate C.
Official merchandise of Falkenbergs FF can be purchased at the stadium on matchdays and from the club’s online store. There aren’t any stadium tours available for this little ground…don’t be silly! 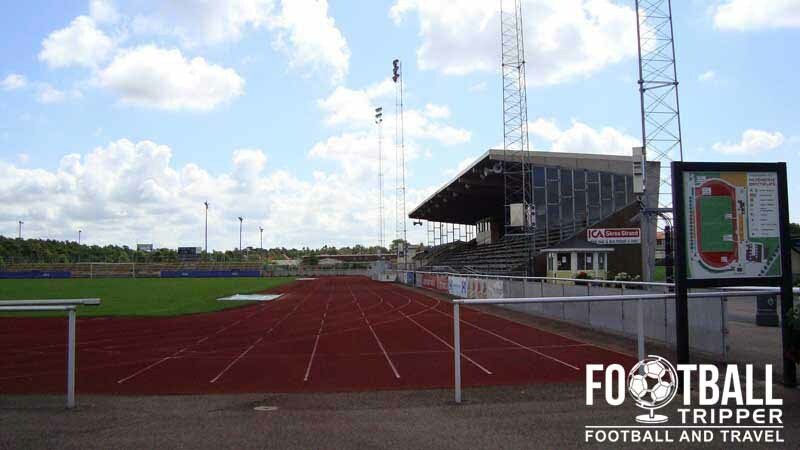 Tickets to see Falkenbergs FF can be purchased during the working week from Falkenberg tourist office between 10.00 am – 5.00 pm, at the stadium on matchdays 90 minutes before kick-off or online from the official website. 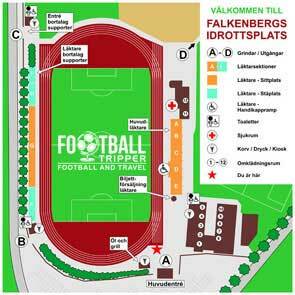 Falkenbergs IP Stadion is situated on the eastern side of the River Atram approximately 1.6 km away from the railway station and city centre. The main entrance gate to Falkenbergs IP Stadium. The walk from the city centre certainly won’t take any more than 20 minutes. There is a decent sized car park located behind the northern goal-end which is available to use on matchdays on a first-come first-served basis. Falkernberg Railway Station is now situated 3.7 km north of the stadium having been relocated from the city centre in 2008. There are a limited number of commuter services which depart from here on a daily basis. A distant view of the stadium as seen from behind the empty goal-end. The sports complex (Idrottsplatd) where the football ground is located is served by the Hertingsskola stop with is south of the stadium along Hertings allé. The closest major flight hub is Halmstad Airport approximately 42 km so the south of Falkernberg. There is a cluster of places to stay around the old railway station such as Nya Pallas Hotell, Grand Hotel Falkenberg and Värdshuset Hwitan AB.